Hi, once again a guest post. Today I'd like to show you a new bookmarklet that you maybe did not know. As you may have already read, the MissionOperation*-Postings have changed their layout. You only see that someone posted an operation, but unless the person was smart enough to add the type to the post, you do not know what type it is. Even worse if you're trying to finish your collection! Jen already mentioned that there is an option on the stream-helper, where you can select the type of missions you're looking for. This is already nice, but you'll probably end up opening 20 mission to find 2-3 with open slots. Even worse for the wars, at least in my mafia! So you'll probably love this bookmarklet! Basically its made of the streamhelper. I took the code that is already in it, the filtering of missions, removed everything except missions and wars, and added some code to check if a war or operation is still active. But let me show it to you. Now get onto Mafia Wars, unframe and run it. You'll see a window like this. You may know the options from the stream helper. Put the number of hours in the first field. If you choose it too low, you'll probably not find much, put it too high and it takes hours. If you're only looking for wars, everything over 16 hours is useless, since the wars ends after that. Experiment with the second field only if you have problems, and best leave the delay to 4-6 seconds. Now for the interesting part: First check the "War" checkbox, if you're looking for active wars. That's easy. 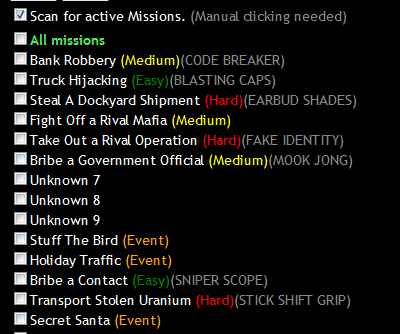 But once you check the "Mission" checkbox, you'll see a list of all types of missions that are known to us. Nice, huh? You even see the collectibles you could get from the mission. Now select the missions you look for, or select all, and run it. If you've never used this script or the stream helper, click on "ask permission" before starting. Once you start, it'll first fetch your news feed and look for wars and missions. The number you see on the top is the total number of found wars and missions. Now the script checks for every one if its still open or already full/finished. This can take a while, but found missions and wars are immediately added to the list. Just click on the link and the list will open. Now click on the last link (NW means: open in New Window) and participate. Article written by Eike, Great fan of the MW Loot Lady Blog and The Informant Podcast, and humble contributor to some Spockholm bookmarklets. great article, but your link to spockholm website is wrong and Spockholm renamed the bookmarklet to Operation War Hunter :-D.
just a quick question, when war hunter is runing can i go back to my fb page without if closing or finishing.....ty.